That subterranean rumbling you may feel as you walk by the New York Theatre Workshop isn’t a forgotten subway line suddenly come to life; it’s the basso-profundo voice of one of New York’s most commanding performers, Patrick Page, slick perfection itself in the role of Hades, King of the Underworld, in the tunefully delicious, theatrically tasty, but dramatically flavorless Hadestown. This new show—a mostly sung-through musical based on the Greek myth of Orpheus and Eurydice, about the power of music, love, and trust—originated as a compilation of songs by folk singer-songwriter Anaïs Mitchell performed at various Vermont venues before becoming an hour-long 2010 concept album. “Hadestown” the album was then developed by Mitchell and the hot young director Rachel Chavkin (Natasha, Pierre & the Great Comet of 1812) into Hadestown the musical, which runs a bit more than two hours, and feels it. Set designer Rachel Hauck has gutted the NYTW to build a wooden arena with the orchestra slotted in at one point and the audience seated on uncomfortable old wooden chairs (unmoored cushions supplied). A huge, leafless tree towers in one corner but no one ever climbs it. And, aided by lots of smoke, Bradley King’s flamboyant lighting, sometimes enhanced by small lanterns in the dark, sculpts the action in rock concert style. Actors in close proximity to the spectators create a mildly immersive ambience, although far from the level of Natasha, Pierre . . . 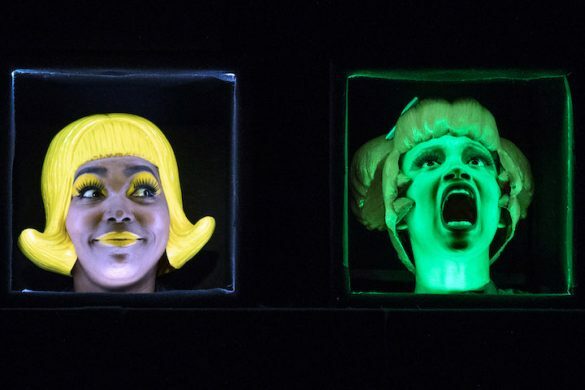 This is the myth in which the exquisitely gifted musician Orpheus (Damon Daunno, a high tenor with middling charisma) descends to Hades to bring his dead sweetheart, Eurydice (Nabiyah Be, bewitching) back to the world of the living. Only after hearing Orpheus’ music does Hades relent, but he insists that if Orpheus looks back to see if Eurydice is following him she’ll have to stay below forever. 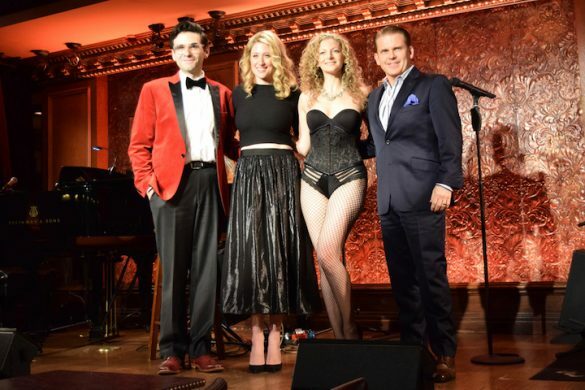 For a show inspired by a tale dramatized in countless films, plays, and operas (from classical to rock) it’s disappointing to see how little drama has been squeezed from it here, despite the many appealing songs and the infusion of a capitalistic exploitation theme. The songs are primarily concerned with atmospherics, their lyrics only indirectly offering exposition, revealing character, or moving the plot along. The basic myth remains intact although Eurydice goes to Hadestown (by train, it should be noted), not because she’s dead but as a personal choice, seeking to escape the hard times up on top where, the lyrics say, “the chips are down”; her road to Hell, then, is paved with good intentions. 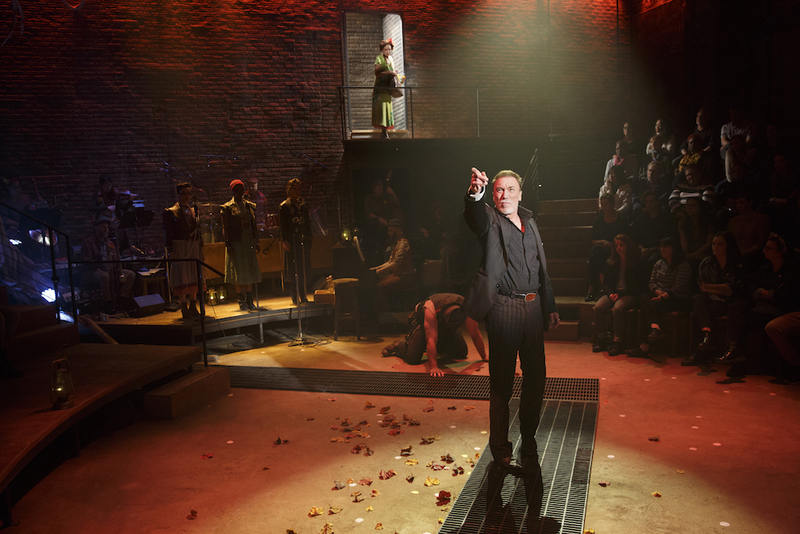 Hadestown’s existence is intentionally ambiguous; no one there seems dead but everything’s symbolic and not meant to be taken literally. Hades’ wife, Queen Persephone (Amber Gray, sassily sensational), representing the seasons, is something of a snow bird, living half the year above ground, half under. The suave, black-suited, shades-wearing Hades, who wants to protect his people by keeping the enemy, poverty, away, sings about it in a song, “Why We Build the Wall”; ironically, it was written before Mr. Trump made a fuss about his own wall. The Fates, a trio of hipster women (Lulu Fall, Shaina Taub, and Jessie Shelton) comment on everything in perfect harmony, sometimes playing instruments, while the main narrative functions fall to the growly-voiced, burly but light-on-his feet Hermes (Chris Sullivan, ultra-cool), in a jazzy dark suit, swinging watch chain, and pork pie hat. In keeping with the New Orleans jazz, blues, and folk music everyone wears hip clothes (designed by Michael Krass) ranging from the fifties to today; Orpheus, for example, dresses in James Dean-like jeans, t-shirt, and red windbreaker, while Persephone brings Billie Holiday to mind in her long, green, floral-print dress and decorative hair ornament. Concept albums tie a number of songs together by theme or narrative consistency but, even though a number of such albums have been turned into major shows (including the new revival of You’re a Good Man, Charlie Brown), such continuity doesn’t necessarily equate with dramatic interest. 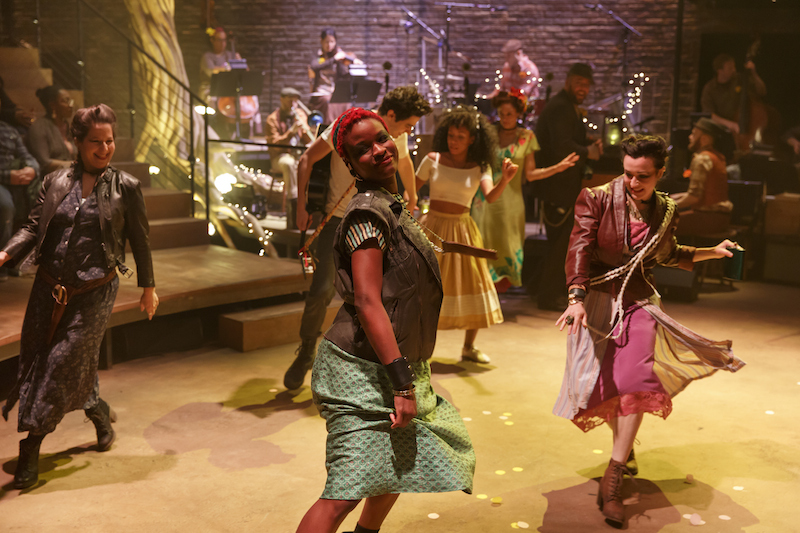 Hadestown, with its extensive use of mics, and even a section where Persephone introduces each orchestra member for applause, is basically a well-staged concert. 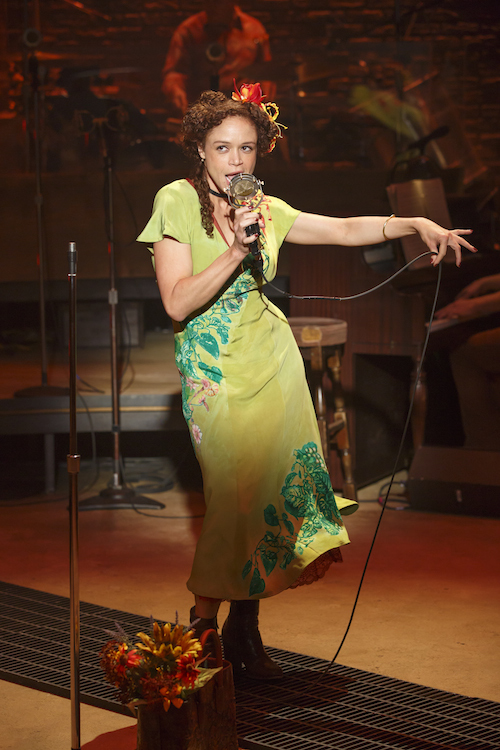 Judging by the warm response, however, many will have a hot time in old Hadestown tonight.